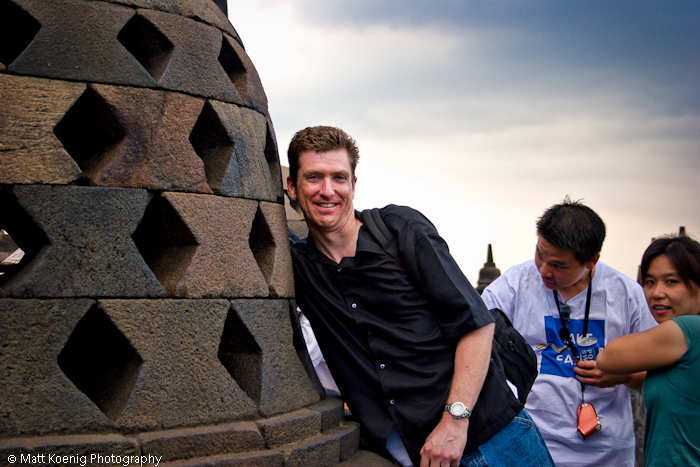 In 2005 we had the opportunity to visit Borobudur. If you are not familiar with Borobudur it is a 9th century (meaning this thing was built somewhere around 800 AD) Buddhist monument location in Central Java Indonesia. We had been staying in Yogyakarta so we hired a driver who drove us to Borobudur. The drive takes about 45 minutes or longer if you stop to see the batik and silver shops. We got a late start as we had spent the morning at Prambanan. This turned out to be a blessing for reasons that will soon be seen. After paying our entry fee (foreigners: Rp. 95000 ~11USD Residents: Rp. 9000) we entered the grounds. The entrance was actually a bit of distance from the actual temple but there is a shuttle you can take that brings you to the bottom of the steps leading up to it. You can also choose to walk which is nice as the grounds are quite beautiful and the distance is not unbearably far. As we approached the actual temple I was amazed at its sheer size. Pictures do not do it justice. You have to experience it for yourself. It sits on a small hill called Kedu Basin. After clambering up the multitude of stairs you find yourself on a broad shelf which is the first level of the temple also known as the foot (part of which is hidden). The temple has 9 platforms or levels each representing one stage of enlightenment; the six lower are square in shape and the 3 upper are circular. While we were wandering around the foot of the temple admiring the sheer magnitude we were approached by a guide offering his services to show us around the temple and give us the history. I forget what his rate was but it was very reasonable. I strongly recommend finding a guide to take you around. They are very knowledgeable about the temple and all the historical aspects of it. Our experience would not have been the same without his commentary. Don’t worry, they all speak very good English as well as a multitude of other languages. Maybe they thought I was Brad Pitt? While we were admiring the incredible beauty of the temple we noticed this group of school kids staring at us and pointing. I looked behind me thinking there was some incredible site to see but there was nothing. After several minutes of the staring, mixed in with an occasional coy wave, their teacher walked over and said something to my wife. She came over and said the students were wondering if they could have a picture taken with me. Maybe they thought I was Brad Pitt? Whatever their reason I obliged and they all gathered around and we had some fun taking photos. Later I saw them all a few levels above us on the temple smiling and waving. 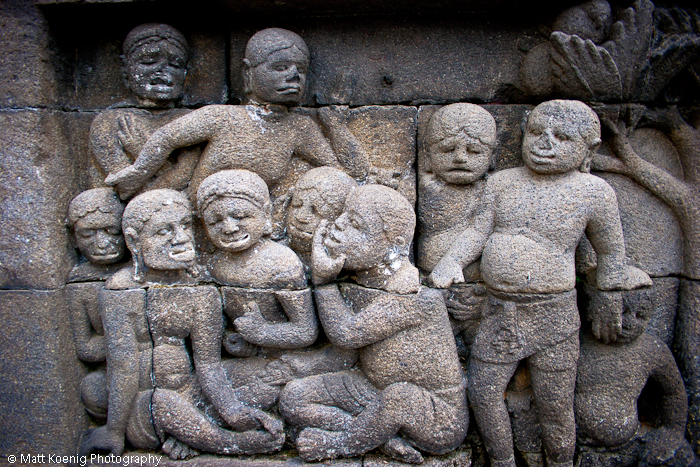 One of the coolest features of Borobudur are the bas relief panels. 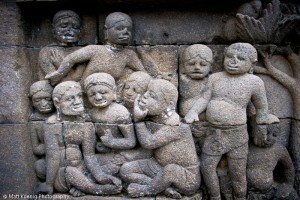 Borobudur has approximately 2670 individual reliefs (1460 narrative and 1212 decorative) and cover the lower 6 square platforms. The panels tell the story of Sudhana and Manohara and the search for ultimate truth. These panels are very detailed and incredibly beautiful. Our guide knew the entire story and would have recited all of it panel by panel had we allowed him to but we wanted to make our way to the top of the temple. Each of the platforms or levels represents a stage of life. To get to the top you walk in a clockwise direction keeping your right shoulder toward the center of the temple. The base is called Kamadhatu and symbolizes humans that are still bound by lust. The next 4 levels represent Rupadhatu or humans that have managed to free themselves of lust but are still tied to their appearance and shape. The next 3 platforms are called Arupadhatu and symbolize humans that have been freed of lust, appearance and shape. The very top part is referred to as Arupa and is where Buddha is residing; nirvana. I made this entire walk with our guide all the way to nirvana. My long ape arms finally came in handy and I have been granted extraordinary luck since 2005. All along the journey are many Buddha statues. There are a total of 504 throughout Borobudur. At you reach the Arupadhatu level the Buddha statues are placed inside stupas. There are a total of 72 stupas. It is widely believed that if you can reach inside the stupa and touch the fingers of the Buddha that you will be granted good luck. My long ape arms finally came in handy and I have been granted extraordinary luck since 2005. The view from the top is incredible. Since we had arrived later in the day we were there for sunset which made it feel even more magical. This was one of the blessings of coming later. The other blessing was that people were now started to head for the exits so I was able to get some photos of the stupas and Buddhas without people in them. Our guide took us to all the cool spots to get photos and assured us we were fine even as voices were shouting over the loudspeakers that we had to leave. The main dome at the top is surrounded by 72 Buddha statues inside of stupa. The view from here is incredible. The temple actually sites between two volcanoes; Sundoro-Sumbing and Merbabu-Merapi. Merapi is the volcano that erupted most recently causing so much concern. One of my plans when we are back in Indonesia is to take a sunrise tour where you can get into the park early and get some fantastic sunrise shots. As we made our way down and toward the exit of the park we had to make our way through vendor stalls. Thankfully due to it being so late now all of the vendors were gone so we didn’t have to endure any of the prolific selling propositions that I can only imagine go on during normal hours. There was no direct exit that we saw. Instead we had to wind our way through what seemed like hundreds of stalls. It was near dark as we found our car and driver ready to take us back to Yogyakarta. One thing to note if you are there in the evening; the CDC indicates that there is a risk of malaria at the Borobudur temple complex. I did not take any anti-malaria meds or repellant but I thought I would make note of the risk indicated by the CDC for those concerned. I really recommend seeing Borobudur in person if you find yourself in that part of the world. It is an incredible site to see, and don’t forget that it is a World Heritage Site. Make sure you get a guide because it makes the experience so much better. Have you been to Borobudur? I’d love to hear about your personal experience there. This looks really cool. I’ve never been anywhere close to Borobudur, but it sounds like a place from Middle Earth… And, now that you’ve posted pictures, I’m sure that it’s from Middle Earth. Very cool photos. I actually like that locals pay 1/10 of the price. In some cases it’s equal and it means they don’t have access to their own heritage and history. Hi Ayngelina! I’m really glad you made this comment as I think it is a great perspective. How easy it is for us to just think that foreigners are being taken advantage of with the different pricing and not think about the right of locals to be able to experience and learn about their own culture. The only time that I have been disturbed by an entrance fee was at Besakih Temple in Bali. Thanks Sarah! On our 2005 trip to Indonesia I took over 5000 images. I’m still working to process a good number of them. Last time I went there was when I was in 6th grade! 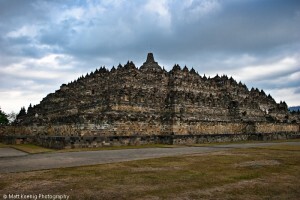 Another visit is overdue… It’s truly a magnificent relic of Indonesia’s history. Hi Jill! Sounds like you are long overdue for a return. I was truly amazed by this incredible monument. Can’t wait to return. Wow- incredible! How far is that from where you’ll be staying next year? Will you be in Yogyakarta again? 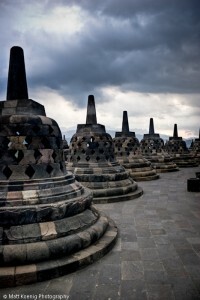 We’ll (that’s right, I said we) have to hit Borobudur, for sure! Hi Mark! This is a ways from where we will be staying. 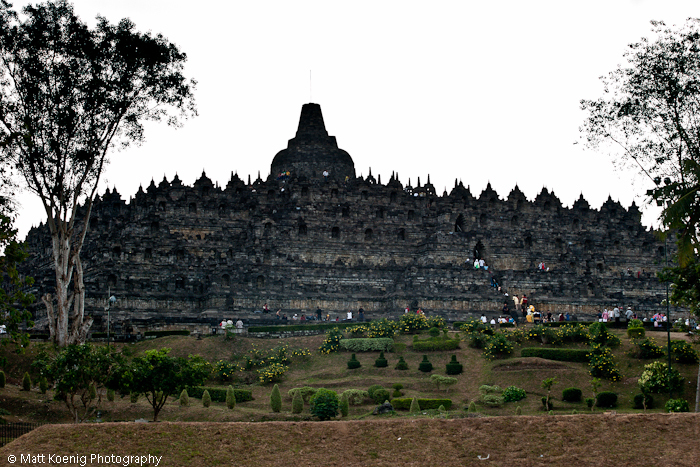 Last time we took a long train ride to Yogyakarta (7-8 hours I think) and then hired a driver to take us to Borobudur. I really like Yogyakarta and would love to spend more time there. WE (yes, I also said we) will have to get over there and check it out as well as Prambanan which is near there. Picture do not do either justice. You have to experience it in person. One more reason why I can’t wait to go back to Indonesia. This looks amazing and far better than the prostitutes of Kuta ahaha. Another option for our big event perhaps! Matt! Yeah, you gotta check out Borobudur next time you are there. Incredible place. wow, that place is massive. I love how you captured the small details of the stone carvings in your photos. I’ve never heard of this place, but it’s now on my list. Hi Mary! It is deceptively massive. The details in the carvings are incredible. I would love to go through next time and look at each and every one and follow the story. That is where it is nice to have the guide. He told us so much about the carvings and the story they tell. Definitely keep it on your list. I hope you make it there one day. Matt, I have heard something about a eruption of mount merapi after which the temple is covered with ash, is it ok now? Are they allowing tourists again? Hi Beth! Yes I believe there was some issue with the erruption of Mt. Merapi recently as Borobudur is pretty close. I remember being able to see Merapi from there. I am not sure how that affected tourism of Borobudur or what affect that has had on the temple. Maybe someone else reading this has a more recent experience there. Hi Cam! Yes, it is an incredible place. It’s amazing and a bit surreal to think how old it is and that people built this thing. Incredible!! On your next visit, make sure that you see Ramayana Ballet Dance at Prambanan Temple. Mostly we have to book the ticket, first. It had big open dance performance around October, each year. About the difference of entrance fee. I have to say, that mostly foreigner can have more access rather than us, the local. It is indeed make me sad – remembering my experience see the bull race in Madura Island, while the foreigner have same entrance fee with local, but they have priority to have good view. Even stand inside the bull race yard. Lucky that I do not have alike local face, even I am 100% Indonesia. Hi Tristi! I think seeing the Ramayana Ballet would be incredible. I hope to get the chance to experience that one day. I’m saddened to think that many Indonesians do not have the opportunity to experience their own cultural heritage. How do you think that could change to allow everyone the same opportunities?